Travelling can be an ordeal, especially if you're not doing it right. Yes, I believe there is a right and wrong way to travel. The first time I flew on an airplane alone, I was 5 years old. Granted, my family could meet me at the gate back in those days, but my point is that I've been at it a while. 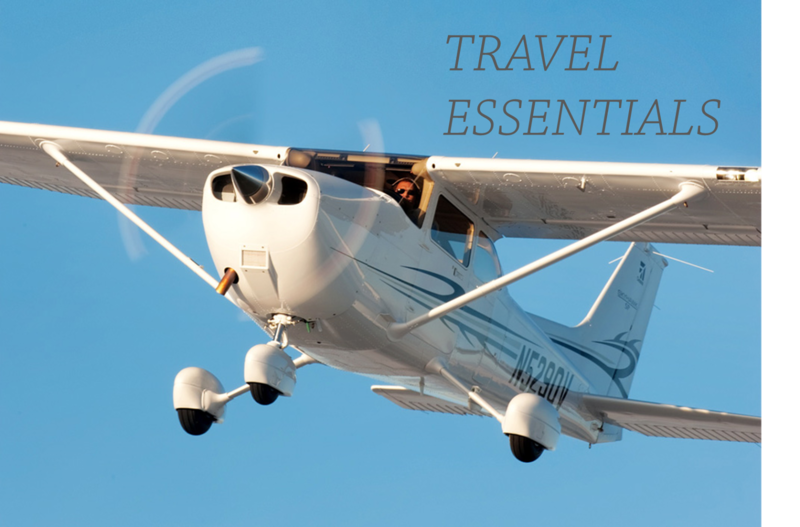 Below are some of the practical travel accessories that I've found make any trip a whole lot easier. ONE: Ban.do mobile charger - the days of relying on power outlets to charge your electronics are far behind you. Make sure you never lose a charge with this fun portable charger. TWO: Target Sonia Kashuk beauty organizer - keeping your cosmetics all in one place is a must when travelling. This cute palm print will make packing a little more fun. THREE: Clare Vivier luggage tag - a bright luggage tag will help you spot your bag in the sea of lookalike luggage that is baggage claim. FOUR: Always Rooney passport case - I don't know about you, but my carry on always starts off super organized, but as soon as I get to the airport things change. This cute leather case will help you keep track of your passport so you can easily grab it when you need it. FIVE: Mini travel steamer - this doubles as a home AND travel must have. For those of you who hate ironing use this mini steamer and keep wrinkles from ruining your otherwise fabulous outfit. SIX: Colgate wisps - for any longer plane ride, I love using these disposable mini toothbrushes (no water required!) to keep your teeth fresh and clean. SEVEN: yes to cucumbers face towelettes are perfect to freshen up your face without having to wash it. The cucumber scent is also very soothing! EIGHT: ElizabethW sleep mask - make sure you can fall asleep and block out light with a pretty sleep mask. NINE: Gotoob travel bottles - don't worry about your shampoo bottles exploding everywhere anymore; these silicone travel bottles are flexible so you can squeeze every last ounce of product out. TEN: Honest hand sanitizer - I carry this around in my bag whether I'm travelling or not. It's always good to have in a pinch, and smells wonderful. ELEVEN: Bose headphones - good, comfortable headphones are a must when travelling. I'd recommend splurging for the noise cancelling ones to better your travel experience even more. If you're travelling with a friend, you might also consider a headphone splitter to watch/listen together. TWELVE: 4-1 travel adapter - for the world traveler, this all inclusive adapter has you covered no matter where you're going. THIRTEEN: Mini dual voltage curling iron - the mini and dual voltage are key here, especially if you're travelling overseas, you don't have to worry about frying your tools with the wrong voltage. This mini curling iron probably won't cut it if you have really long hair, but is great for shorter lengths. These days, most hotels have blow dryers, but depending on your styling needs you can get a mini straightener or travel hair dryer (all dual voltage). If I know I'll be blow drying a lot, and need a nozzle, I travel with my regular Harry Josh pro dryer which, while pricey, is hands down the best beauty investment I've made. FOURTEEN: Luggage scale - okay, who's tired of rearranging your packing situation at check in? I am! Scoop up a luggage scale and never unpack at the gate again. FIFTEEN: In transit spray on moisture - most people are prone to dry skin while travelling, especially with recirculated air. This spray moisture doesn't clog pores, and you can use it on your face and body to stay hydrated. SIXTEEN: Travel laundry bag - this nylon bag is ultra compact (fits in the palm of your hand) and will keep your dirty clothes properly sequestered from the clean. SEVENTEEN: Kate Spade shoe bag - don't let the shoes you wear outside get your nice clean clothes dirty. Kate Spade also makes cute intimates bags as well. EIGHTEEN: Memory foam pillow - things that can be stuffed into tiny bags are what make travel accessories convenient. This pillow will support your neck on long flights and become compact when you're done using it to save space. NINETEEN: Minimergency kit - this tiny studded case holds tons of things that come in handy like a sewing kit and double sided tape.